In the course of the Church’s history, three ministries have emerged as ministries to which access comes through ordination. These are the three so-called holy orders. We know them as the episcopacy, priesthood and diaconate. Though different in scope, all three are part of the one sacrament of holy orders. The Second Vatican Council speaks of one ‘divinely established ministry which is exercised on three levels by those who from antiquity have been called bishops, priests and deacons’ (Lumen Gentium § 28). Women were given the full ordination to the diaconate in the Early Church. 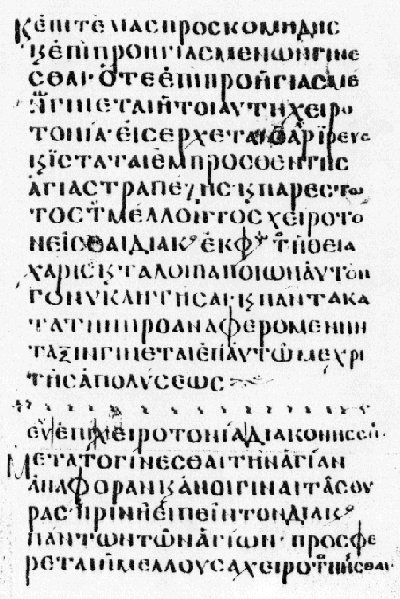 Page from the Codex Barberini gr. 336 (780 AD) with the opening of the ordination rite for women deacons. The practice has been documented extensively for the first nine centuries in especially the Eastern part of the Church. Women deacons assisted in the baptism of women which required anointing and immersion of the whole body. We know the exact ordination rites that were used. They involve the imposition of hands by the bishop, the invocation of the Holy Spirit to impart the diaconate and the imposition of the diaconate stole. Read here one typical example of a diaconate ordination rite. The ordination to the diaconate was identical in all essentials for men and women. If women deacons were not ordained validly, then neither were the male deacons. The Eastern part of the Church was at that time fully Catholic, since the schism with the West only took place in 1054. The practice of ordinaing women deacons can be traced back to St. Paul. Co-ministering with him was Phoebe, ‘the deacon of the church at Cenchreae’ (Romans 16,1-2). International Church Councils, such as Chalcedon, Trullo and Nicaea II endorsed the ordination of women as deacons. If women received holy orders then, they surely can receive them now.